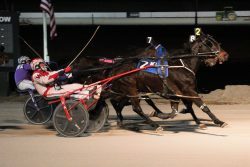 Lebanon, OH — My Buddy Ninkster pulled another mild upset, as he often does, in the $24,000 Open I Handicap at Miami Valley on Saturday night (Feb. 9). My Buddy Ninkster sprung the upset in the $24,000 Open at Miami Valley Saturday. Brad Conrad Photo. Rarely dispatched as a favorite, this 1:51.1 victory was My Buddy Ninkster’s tenth in the past 13 months against the best pacers in central and southwest Ohio. Todd Warren guided the 7-year-old son of Dali to the narrow come-from-behind score over open class heavyweights Nuclear Dragon (Dan Noble) and Granite (Brett Miller), who were lapped on at the wire. The winner paid $10.80. The co-featured $20,000 Open II was captured in front-stepping fashion by Cruise Patrol (Brett Miller) in 1:50.4. The favored 6-year-old son of Bettor’s Delight topped Doctor Carter (Chris Page) and Whataboy (Tyler Smith) to earn his initial victory of 2019, raising his lifetime bounty to $251,056 by doing so. Chris Short has been training the impressive winner for owner Coleen Dowdall. Two divisions of the brand new Bill Dailey Memorial Medley series also were presented on the Saturday program. The initial leg of this late-closer featured 5/8th-mile dashes for $12,500 purses. Next week the same horses will compete at the standard one-mile distance for $17,500 bounties; and the $25,000 championship leg on February 23 will be contested at 1-1/4 miles. The Dark Shadow (Chris Page) pressed to the front just past the first quarter and held off runner-up Duel Of Truth (Kyle Ater) and show finisher Royale Rose (Mike Oosting) in the stretch. The heavily favored 5-year-old son of Shadow Play, owned by Burke Racing Stable LLC and Weaver Bruscemi LLC, returned $4.00. The second split went to Hunchie (Cameron McCown), who used the coveted rail position to full advantage. The Vince Hanna-trainee lead Southern Flight (Jason Brewer) and Angelo J Fra (Page) through the final teletimer beam in his first start of the year. Frederick Reed IV owns the 9-year-old by No Pan Intended who returned a healthy $21.00 to his mutuel backers.